One of the best parts of my job as assistant 4’s teacher at the Community Cooperative Nursery School is baking and cooking with the children. We make something each week. Our focus is more on the process than the product, which means we look at, smell, touch and taste the ingredients. Depending on the recipe, I teach the children to measure, mix, crack an egg, flip a pancake, knead dough, roll out cookies. We always end up with a product most children (and adults) enjoy eating. 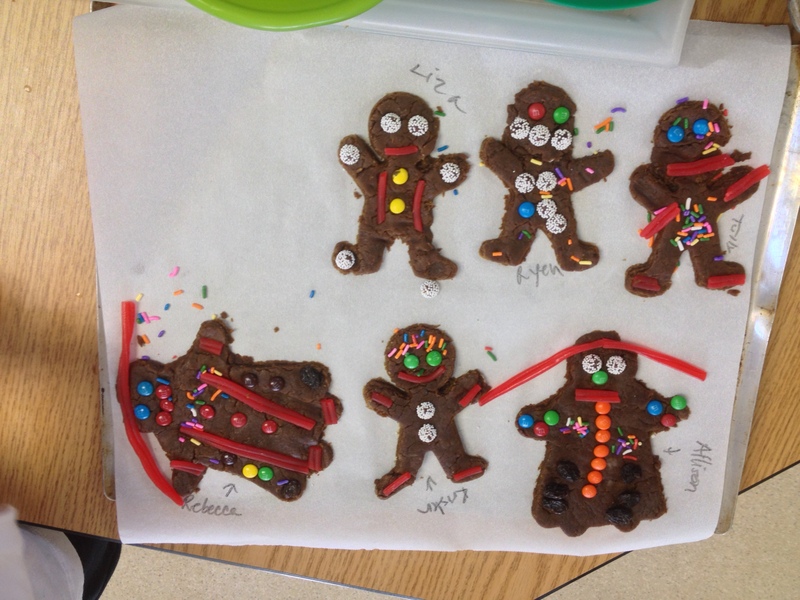 Over the last couple of weeks we have been reading, comparing, and predicting endings to a variety of gingerbread cookie stories. Our head teacher, Dana Gorman, is very creative. 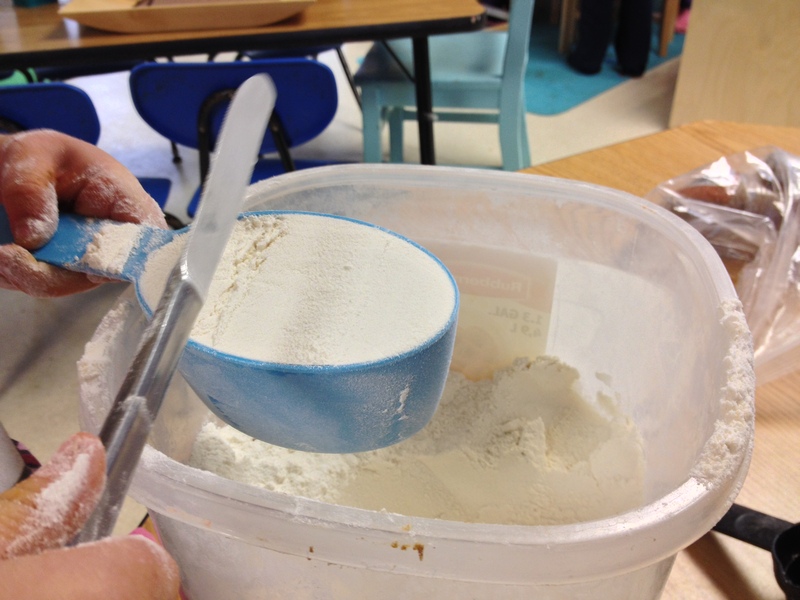 You can check out how she added this to our curriculum in a fun way at her blog, Playfully Learning. 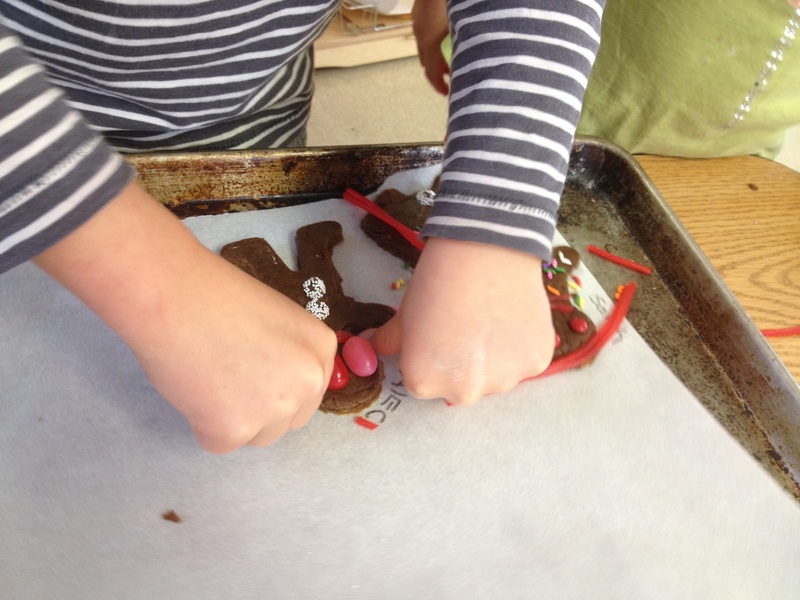 With all the focus on gingerbread stories, baking gingerbread cookies was a natural fit. We made the dough one day and decorated and baked the cookies the next day. I usually work with between 4 and 6 children at a time. We clear the chairs because kitchen chefs don’t sit to do their work either. We made 2 batches of the dough giving all the children an opportunity to help. We started by creaming the butter and sugar using what I like to call, Preschool Power. No electric mixers here. 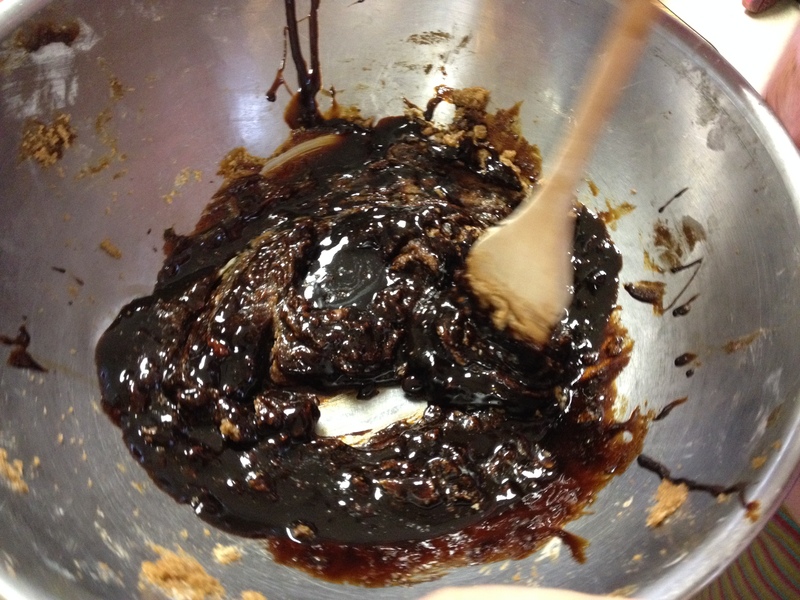 Then we added the dark molasses. The children help one another by holding the bowl for the child mixing. We pick a number and everyone gets to move the wooden spoon that many times around the bowl before passing the bowl on to the next child. Next the children measured dry ingredients. By this point in the year, they are expert levelers. 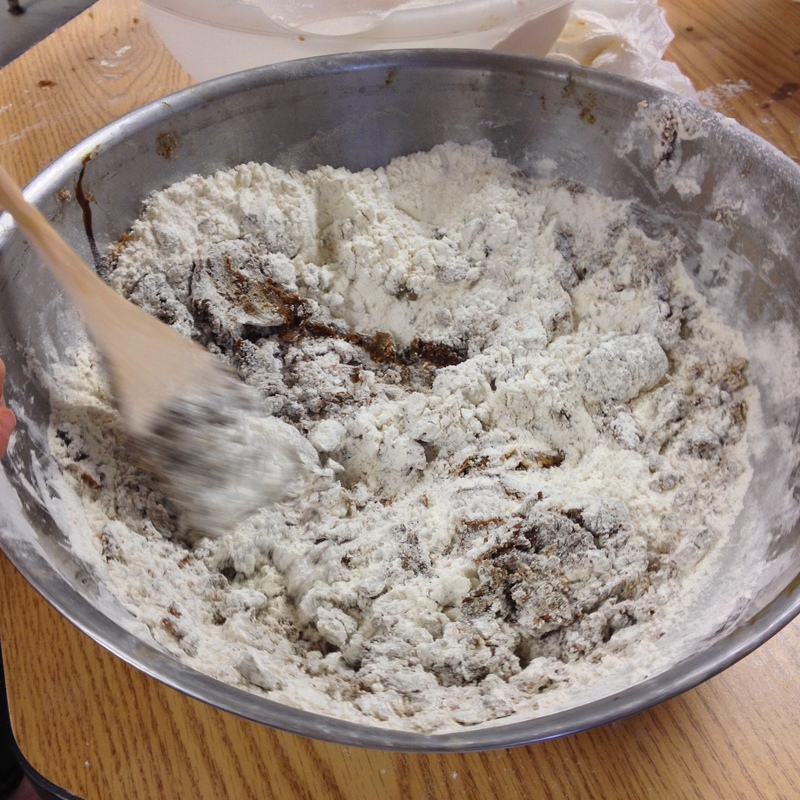 Then we mixed together the wet and dry ingredients and wrapped the finished dough in plastic wrap. 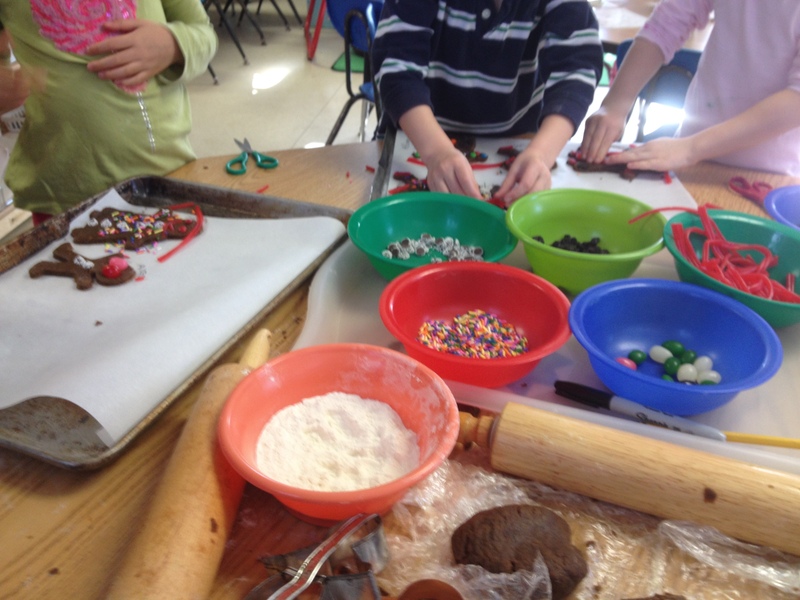 On day two, each child got to roll and decorate his or her own cookie. This dough is quite malleable and easy to squish back together. 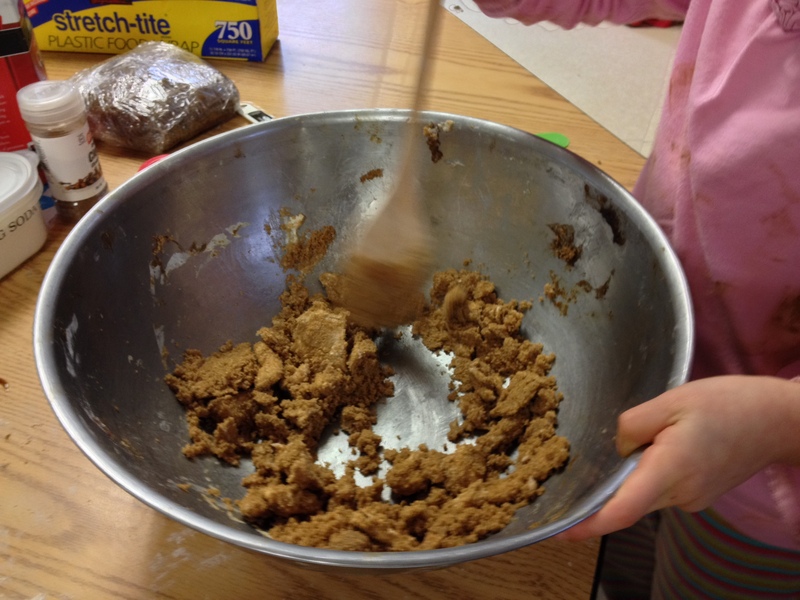 Roll the dough thickly, at least 1/4″ thick, because the children like to press decorations into the cookie. I teach the children to push gently down on the dough as they roll in one direction. I watch the rolling carefully. 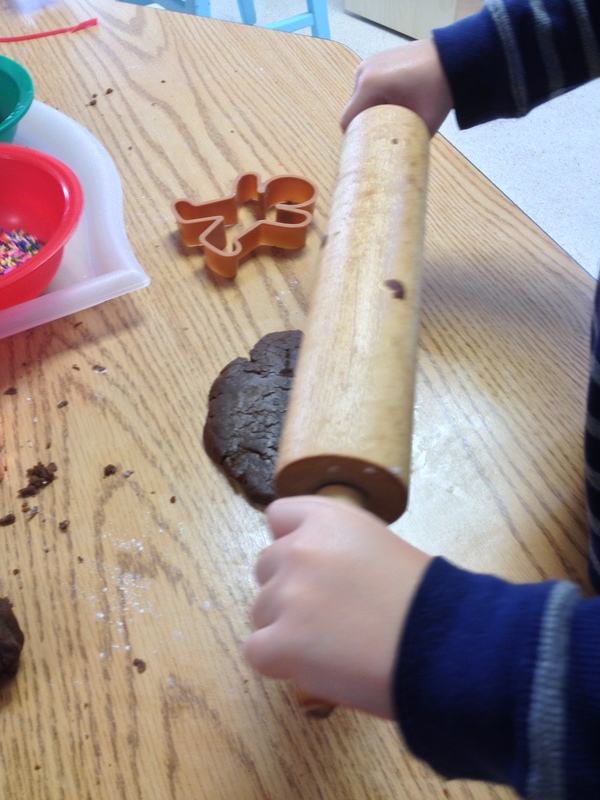 The children will sprinkle on flour if the dough sticks and I help them rotate the dough for even rolling. You can use a bench scraper or a metal spatula to lift the cut-out cookie from the table to the sheet pan. I tell the children “the cookies need a helping hand” to get on the tray. Then the children used the set out decorations to decorate independently. They were so proud of their creations. Here is the recipe we used with a disclaimer: I pulled this off the internet a few years back (I’d give credit if I remembered where it came from). 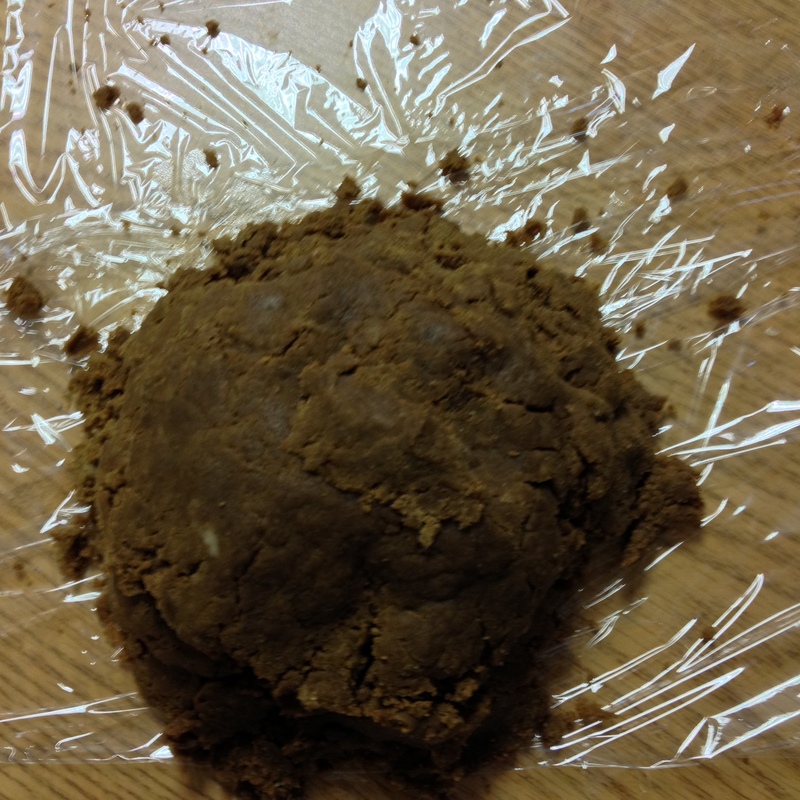 The dough works because it is so malleable but it is not the best tasting cookie. Maybe next year I’ll have a better recipe to share. But if the process of making these cookies is more important than the product, use this one. Every child ate a cookie. Just like in many stories we read, a few crumbs were all that was left. 1. Heat oven to 350F. Blend butter and sugar. Beat in molasses. 2. Combine dry ingredients in a separate bowl. 3. Add dry ingredients to butter mixture in 3 additions, alternating with water. Mix until combined. Add more water a little at a time if still too crumbly. 4. Chill. Roll and cut out cookies. I am going to make these this weekend! How long did you bake them for? Yes… baking time would be helpful. About 8 minutes. Have fun and don’t forget to let the kids pile on the candy for this project. Afterall, it’s only once a year that they decorate a gingerbread cookie!